An everyday essential for summer shoes and sports footwear, this triple pack of ladies Tokyo Laundry Cotton Trainer Socks are lightweight, soft and smooth woven with a combed feel. 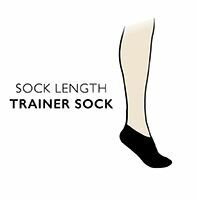 The stretch fit, below ankle socks are non-cushioned, so they won’t add unwanted bulk to the inside of the shoes and will keep you cooler, with excellent breathability. The socks in this three-pair pack are cotton rich, and have been designed with a Tokyo Laundry logo running across the instep, and in a contrast colour along with a matching slim stripe around the sock cuff.